This fluid gel has been specially formulated for make-up removal of the eyes. Highly recommended for contact lens wearers. Paraben-free. Extremely rich in Avene thermal spring water, this gel provides all the soothing and softening relief to sensitive or puffy eyelids. Exclusively formulated with extra-gentle cleansing agents, it delicately removes even waterproof make-up. 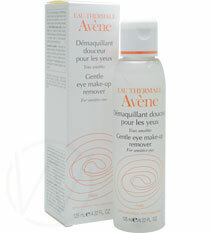 Fluid, crystal-clear and non-greasy, the Gentle eye make-up remover also prevents drying of the eyelid area. Its tear-identical pH level is extremely well-tolerated and does not sting nor irritate the eyes.